Brylei is an exceptional example of what PCMS has to offer. She is a dedicated student who always strives to do her best in the classroom. Brylei is a kind and bubbly student with a friendly personality, but her compassionate disposition makes her stand apart from the crowd. She is the kind of student who brings others together and can build friendships and relationships in people who think they are too different to ever be friends. Brylei is able to see and bring out the best traits of her classmates and is a great encourager among her peers. Her confidence and sassy spirit bring joy to the lives of all she meets. Brylei is a powerful young woman who strives to help others find the qualities that make them special, is never afraid to do the right thing and has a tremendous positive impact on the lives of her family, friends and teachers. To further commemorate this honor, the Rotary Club has placed a plaque in both schools which displays the name of each recipient of this prestigious award. 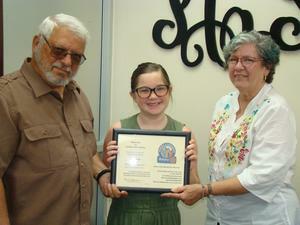 Picture: (left to right) Tony Santore, Rotary Representative, Brylei Simpson, Cathy Santore, Rotary Representative.